Features I think would be usefull - now or in future. As I see it the charger should try to keep the battery as healthy as possible, to allow for the maximum number of cycles. The end user charger has no control of how a battery is drained, or how long it is left drained - so that is beyond its scope. Charging then, breaks down into five phases. Final charging arrangements, when fullness is detected. I suspect the charger can detect when "something" is placed between the positive and negative connectors of the charger. Even if this "thing" might just be a piece of metal. The circuit is completed in some way. So check for things that might break the charger - reversed battery, a piece of metal, whatever comes to mind. Check approximate level of charge. In order to do this it must, as far as I know, place the battery under some load and determine voltage. A fully emptied battery, with a passive voltage check on a VMM will show somewhere around 1.2 volts. So to detect empty - put it under load and the voltage will drop fairly quickly down to 1.1 and below - this would be categorized as phase one or empty battery. A partially full battery can be determined by testing under load also. These generally stay around 1.20 to 1.27 volts, without much change. A mostly full battery would show as being 1.27 to 1.39 or so, under load. I've seen several examples of other chargers amps patterns at beginning of charge. I'm not an electrician so I'm not certain of the effect of Pulse Width Modification (PWM) vs a fixed current, but all the charting I've seen seem to practically equate the two charging methods (purists prefer fixed it seems). In any case to be as gentle as possible on an empty battery, and its chemistry, it would seem to make sense to start slowly with a lower current. Perhaps C/40 or C/50 for 5-10 minutes. 2a. 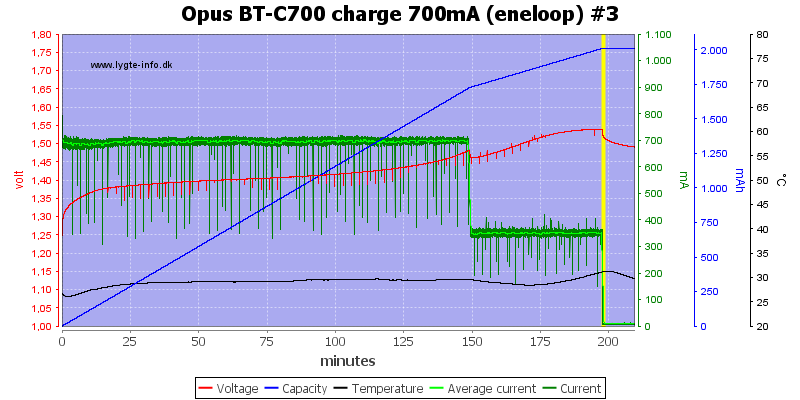 Transition between charge voltages. I propose that all changes of voltage occur in a gradual fashion. Which from a graphing perspective would appear to be a slope or curve. 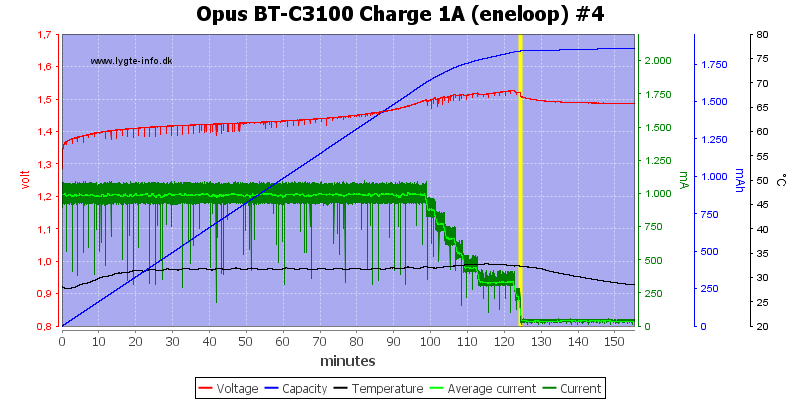 Maybe 2 minutes for transition from C/40 to middle charging current. Keep up the current, watch the voltage, check for loss of circuit (ie: someone removing battery during charge). Test voltage while charging and also while no current is applied, between pulses (assuming PWM). Perhaps, even occasionally checking voltage under load (brief). At some point it is decided that the battery is practically full. So what some chargers do is lower the voltage to avoid as much heating of battery as possible. How much to lower is something that should be discussed. 75%, or multiple levels, 80% for a while, 60% for a bit, 40% etc. As in 2a above always transitioning. If the lowered voltage somehow interferes with "fullness" detection (as in missing a crossover for -dv/dt) some solution could be developed. Transition the voltage down to much lower value. Depending on charge setting a low C/10 or C/20 top off charge could be applied...although usually not. If battery is the old non LSD, then trickle charge might be used (although how to tell the charger that? and also would a user want to?) - probably best not to trickle. Example of a downward slope for voltage - Note: this was for a discharge but the principal is the same. Re: Features I think would be usefull - now or in future. The UltraSmartCharger already does a lot of those things. To be honest with you, I'm dubious about a lot of the things that you're suggesting that the charger doesn't already do. Do you have anything that you can point me to that indicates a benefit to any of your specific suggestions that aren't already implemented? BTW, I'm not sure if English is your main language, but a couple of places where you mention "Voltage" you're actually talking about current - although there is a relationship between voltage and current, they're not equivalent terms - sorry to be picky! Mark wrote: The UltraSmartCharger already does a lot of those things. I realize - just trying to be feature complete. 1. Soft start. If the temperature is above 40 degrees C or below zero degrees C start with a C/10 charge. If the discharged battery voltage is less than 1.0 Volts/cell start with a C/10 charge. If the discharged battery voltage is above 1.29 V/cell start with a C/10 charge. 2. Option: if the discharged battery voltage is above 1.0 Volts/cell, discharge the battery to 1.0 V/cell then proceed to rapid charge. 3. Rapid charge at 1 C until the temperature reaches 45 degrees C, or the dT/dt indicates full charge. 4. After terminating the fast charge, slow charge at C/10 for 4 hours to ensure a full charge. 5. If the voltage climbs to 1.78 V/cell without otherwise terminating, terminate. 6. If the time on fast charge exceeds 1.5 hours without otherwise terminating, terminate the fast charge. 7. If the battery never reaches a condition where the fast charge starts time out the slow charge after 15 hours. 8. Fuel gauge, communication to the device being powered, LED indicators all possible. You caught me. I'm interchanging them incorrectly. Unfortunately, the page that you linked to doesn't actually provide any reason to believe that it's much more than just someone's opinion. At best, it was written before low self discharge LSD cells existed. The claim that the coulometric efficiency when charging NiMH is only 67% is completely false for LSD cells - it's actually very close to 100% in my experience. It might have been true in very early NiMH cells, but I very much doubt that it was that low for more modern (pre LSD) NiMH cells that were in good condition. Such a major error casts doubt over everything else written on that page IMHO. Reading around on CPF, I found one of Paul's early threads on the USC (ultra smart...). So it does use discharge during charge. I don't recall reading that in the forums here. Super. Paul's original firmware did do that, but my firmware just pauses the charge without doing an actual discharge. Burp charging Also called Reflex or Negative Pulse Charging Used in conjunction with pulse charging, it applies a very short discharge pulse, typically 2 to 3 times the charging current for 5 milliseconds, during the charging rest period to depolarise the cell. These pulses dislodge any gas bubbles which have built up on the electrodes during fast charging, speeding up the stabilisation process and hence the overall charging process. The release and diffusion of the gas bubbles is known as "burping". Controversial claims have been made for the improvements in both the charge rate and the battery lifetime as well as for the removal of dendrites made possible by this technique. The least that can be said is that "it does not damage the battery". More info on burping - seems it has a history going back to the late 1960s - and a bit of a sordid history it is. After the patent was awarded he took it to General Electric, then the leading Ni-Cd manufacturer in the US, where it was analyzed in detail. General Electric disappointed Burkett when, after extensive testing, they could find no conclusive evidence that the negative pulse offered any advantage. Burkett then proceeded to find other interested parties that would be less critical, and take his word for the phenomena. He sustained the venture for several years mostly by obtaining government contracts to further study the effect of the negative pulse technique for both sealed and vented Ni-Cd systems.